For the second consecutive week, the No. 4 St. Mary’s Colgan Panthers will meet a ranked opponent. This time, Colgan will travel to face the No. 3 Centralia Panthers in the second round of the 2-1A playoffs. Last week, Colgan made a statement with a 48-6 victory over fifth-ranked Lyndon. Max Wilson rushed for 157 yards and two touchdowns in the first half to help give Colgan a 35-6 lead. Quarterback Bryce Hutchins scored on a pair of touchdown passes and a touchdown run. Colgan has won its four games against 2-1A opponents by a combined score of 210-20. Centralia’s only losses came to a pair of 3A schools in Sabetha and Nemaha Central. The Panthers bounced back after suffering through an injury-riddled 1-8 season last year, that snapped a streak of 20 consecutive playoff appearances. Last week, Centralia topped Doniphan West 63-24. Freshman Devon Feldkamp led the Panthers by rushing for 146 yards and two touchdowns. Kamble Haverkamp added 117 yards and two touchdowns. On the season, quarterback Trenton Flentie leads the Panthers with 1,185 rushing yards and 17 touchdowns. Feldkamp and Haverkamp have contributed 598 and 513 rushing yards, respectively. Isaac Gore has added 352 yards in just four games. Haverkamp has been the team’s primary receiving target having caught 13 of the team’s 23 pass completions for 308 yards and four scores. Expect a tough game between two perennial powers. This will be the tenth meeting all-time between these two sets of Panthers, but the two teams are scheduled to meet during the regular season the next two years. Colgan holds a 6-3 advantage, however Centralia has won the past two meetings with the last coming in the 2011 state semifinal, 24-10. Centralia beat LaCrosse in the state championship the following week. At the beginning of the season, Plainville’s schedule was heavily front-loaded with games against Smith Center, Phillipsburg and Norton. There was a prevailing thought Plainville could be 0-3 after the first three games – and then go on a long winning streak. That’s occurred. The Cardinals have captured seven straight, but have also been impressive in the way they’ve won. Plainville, a surprise 2-1A state runner-up to Troy last year, contained TMP’s high-scoring offense in a 24-6 home win in Week 4. Since then, Plainville won 50-6, defeated Sacred Heart, 50-0, and then collected victories 39-0, 47-14, 49-6 versus La Crosse for the district crown, and 21-0 against Meade in the first round of the playoffs. The Cardinals, which finished second in 2-1A in scoring defense last season, was expected to be strong on that side of the ball again. The Cardinals have an average margin of 30-13 against the No. 9 SOS in the classification, according to Prep Power Index. Plainville is sixth in scoring defense in 2-1A. Sophomore quarterback Jordan Finnesy has completed 55 of 120 passes for 1,035 yards with a 10/6 TD/INT ratio. He has 206 rushes for 1,161 yards and 11 scores. Senior Hayden Gillum and sophomore Jared Casey have both seen time at fullback after Plainville started the year with no true running back. Senior Chandler Cellmer has emerged a big play threat as well. Cellmer leads the trio with 356 rushing yards, but all three have at least 257 rushing yards. They’ve combined for 14 rushing TDs. Gillum has 13.5 TFLs, and Cellmer has picked off five passes, both team highs. Ell-Saline, 3-6 the last two years, was expected to be much improved in 2017. 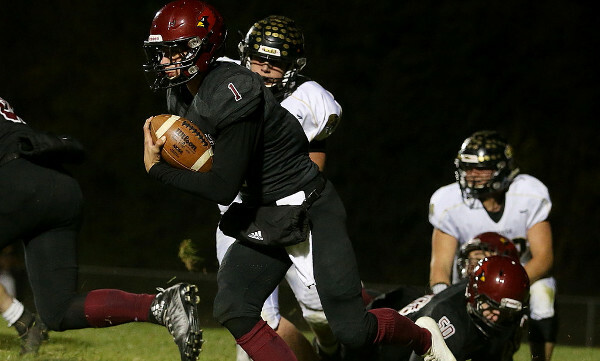 For the second straight week, Ell-Saline played a team nicknamed the Cardinals in the playoffs. In Week 1 and in the first round of the playoffs, Ell-Saline defeated the Sedgwick Cardinals, big wins that have fueled the turnaround. Sedgwick has had multiple close victories, including 31-21 versus Sedgwick in the regular season and 14-6 against Hutchinson Trinity in Week 5. After an odd no-contest versus Sterling in Week 6 (the game was postponed because of weather and the teams couldn’t agree on a makeup date), Ell-Saline had walked a tightrope in close victories. In Week 7, Ell-Saline pulled away late for a 27-8 win against Republic County, and needed to come back to beat Sacred Heart, 28-21. After a 54-0 loss to Smith Center – the Redmen scored three times before they ran an offensive play – Ell-Saline held off Sedgwick, 44-41, in the first round. Junior quarterback Nick Davenport has fueled the offense for longtime coach Terry King. The 8-1 Cardinals have an average score of 24-17 versus the No. 26 SOS. Against Sedgwick last week, Davenport started the game on the sidelines with a toe injury, and sophomore Sawyer Kramer ran the offense. Ell-Saline was multi-faceted throughout the season but went run-heavy wishbone with Kramer. Davenport returned to the game in the second quarter and had a rushing touchdown with 19 seconds left before intermission to cut the deficit to 24-14. Sedgwick bumped the lead to 31-14 before Davenport responded with a pair of rushing scores to help Ell-Saline lead 35-34. Davenport added another score late, had a safety off a sack, recovered an onside kick, and then on Sedgwick’s game-ending, multiple-lateral play, recovered a fumble to end the contest. He finished with 175 rushing yards in the complete performance and helped Ell-Saline rush for 411 yards. This is the first meeting between the teams since 2013, a 14-0 Plainville win. Ell-Saline, especially if Davenport can play at a high level, has the veteran line and quarterback play to keep this game close. However, Plainville’s improved running game, Gillum’s talent and Finnesy’s ability earns Plainville the win.